It is usually just a matter of time before the yoga practice gets it’s hold on you. Eventually you realize that you are involved in a bigger picture and it is up to all of us to do our part. If you are truly passionate about something – speak up and at the very least you will find other people who share your interest. Hopefully you will also inspire someone to think differently as through awareness, anything is possible. In 2008, reluctantly prompted by my dear friend and teacher Seane Corn, I took the Off the Mat Into the World Seva Pledge and spent the year fundraising $25,000 for the Cambodian Children’s Fund. Investing only $20 in the fundraising process I took on grass roots fund raising initiatives such as the trash tour where I traveled with all of my trash accumulated for 3 months to educate about sustainability and draw a parallel to the thousands of Cambodian children living in trash dumps. In 2009 I traveled to Cambodia to work in the orphanage and see everything first hand. The experience was life changing and inspired me to do more. 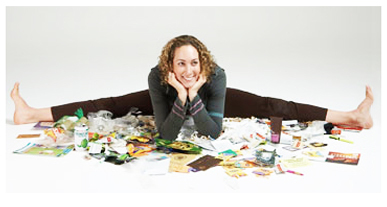 Currently I enjoy collaborating with many of the sponsors and organizations that supported the trash tour and in 2009 I created the Redefining Balance project as a result. 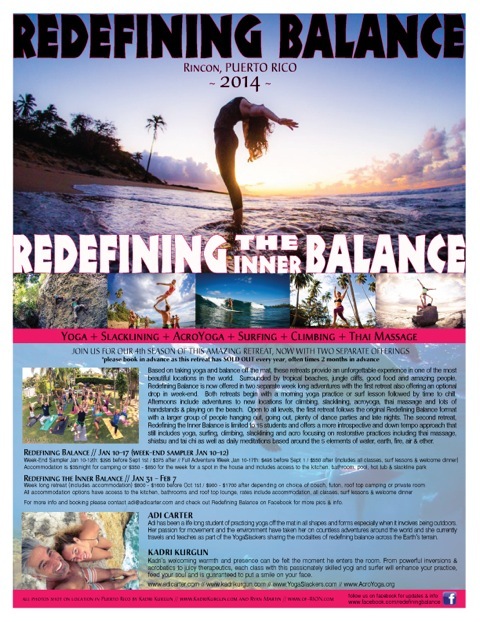 Originally intended to combine the practices of Slacklining and AcroYoga, Redefining Balance now seeks to incorporate the modalities of outdoor activities such as surfing, rock climbing, trail running and biking into several retreats offered each year. These programs get students off the mat and into nature to experience learning to climb and surf as a connection to the planet. A portion of the proceeds from these retreats are then given back to either the Access Fund (climbing) or the Surfrider Foundation (surfing) to support the larger organizations working to preserve our planet. The alarming amount of toxicity in the environment is a direct result of our actions and what is going on inside of us as individuals. If we want to clean up the world, we need to first do the work on ourselves and then take that work outwards in the shapes and forms that inspire others to do the same. 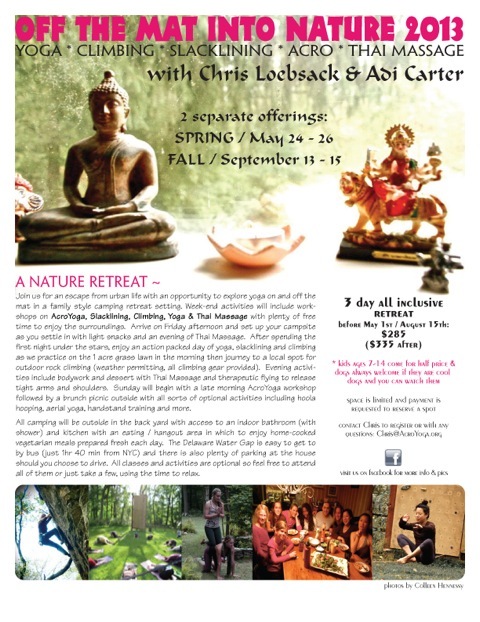 Through Redefining Balance & Off the Mat into Nature we hope to introduce students to a passion for being outdoors with the hopes that the experience will help motivate actions towards environmental preservation on even the smallest level (like carrying a reusable water bottle or reusable bags for groceries). 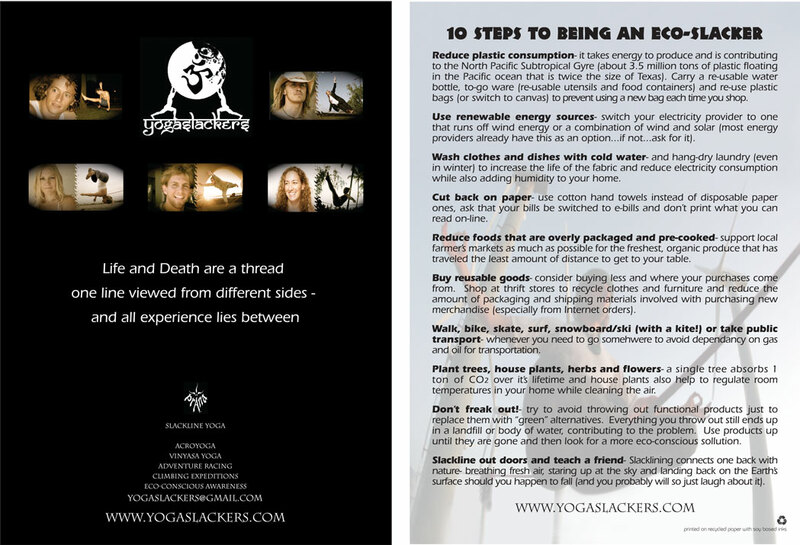 If you need a place to start you can check out the 10 things you can do for $10 or less list (also above to the right and the first ever YogaSlackers “business card”).Start small and think big…you are part of the solution- don’t forget to enjoy the journey and savor the experience.